Knit Picks Offers Needles Now! Check it out – Knit Picks is selling their own line of needles (interchangeables, DPNs and regular circulars)! AND THEY’RE CHEAP!!!! Yay! I’ve been putting off a Knit Picks order for a few weeks. This might be what pushes me over the edge! Unfortunately, the sock yarn I want will not be in until the end of the month so I probably will not place an order until then. But hey, spread the word – CHEAP NEEDLES! I finished the sock yesterday – pictures to come this evening or tomorrow. I cast off with a sz 4 needle and it was too big so I’m going to pick up those stitches and bind off again with a 2. Otherwise, it fits well. Now, it’s off to sock #2! I must force myself to start the second sock! 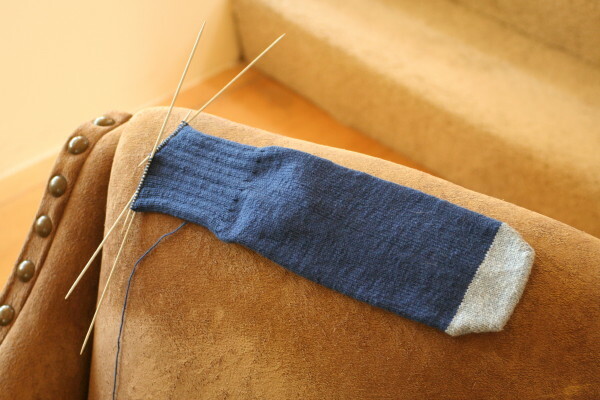 Sock knitters beware: the photos below depict the most boring sock pattern ever!!!! It’s killing me. I’m several inches away from the top of Aaron’s sock. I’m doing a 3 x 1 rib up from the ankle. It’s hard to see the ribbing but you’ll see it more clearly when I post an FO picture with Aaron wearing them! I hope will fit around his leg. The DPNs make it impossible for him to try it on. I suppose I could take out the DPNs, string it on a piece of scrap yarn and then have him try it on but I’ve just decided I’ll frog it a few inches if necessary. At least I made it to the ankle. Why do men have such long feet??? Ugh – it took forever! I fit in lots of knitting this week because I was really tired and spent much of my free time on the couch. It must have been a baby growth spurt! I’ve posted more recent belly pictures over on my Flickr account, in case you’re interested. There are only about 8 weeks left. I’ve been having little discussions with the kid about how it should really come in about 5 weeks but I don’t know if it’s getting the message. Speaking of baby arrivals, go congratulate Cari on the birth of the long awaited Thumper!!!! 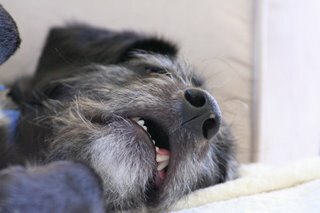 Finally, I’ll leave you with a picture of Jacques asleep on the couch. This dog sleeps on his back with all four paws in the air and his mouth open. I think he’s actually drooling in this picture. He is such an old man dog. *sigh*. Celebrate an FO with What? A New Project? The Spring Grass Socks are DONE! Check them out! See? I told you I would not post again until I had a finished work to show for myself! I still need to weave in the ends but that’s it. They’re a bit too short on me but they’ll fit my mom. I will have to explain to her that hand-knit cotton socks are not as stretchy as mass produced socks. I think she will have trouble getting used to that but like I said before, this wouldn’t be an issue if she weren’t allergic to wool! I really loved this pattern. It wasn’t until I started the second sock that I was finally able to memorize the pattern. It was quite simple once I got it but it took me a while. I think I will knit this pattern again but I will definitely use wool to improve the stretchiness. 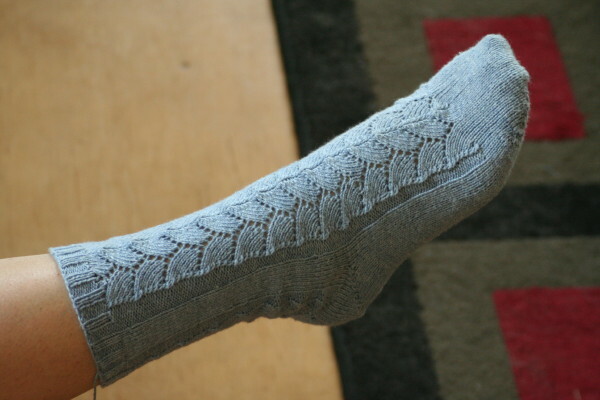 I also want to try out one of Craftaholic‘s other patterns – Orchid Socks. Since the pattern requires shifting stitches around a little bit, I think I’ll wait until I have a long circular free. I cannot stand moving stitches around on DPNs. It offends my sense of symmetry in addition to being a royal pain! Because I’ve decided this must be the Summer of Socks, I’ve started a new pair with some of the Fortissima that I just received in the mail. 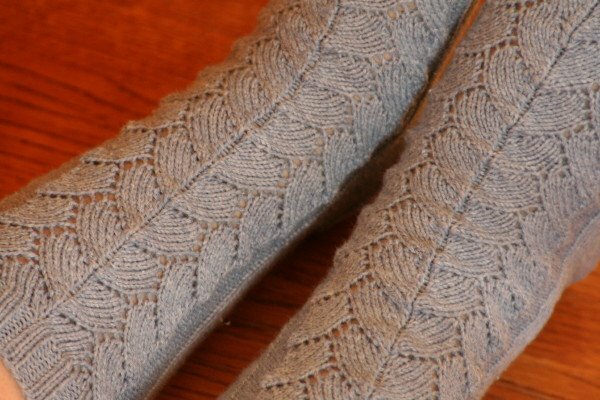 These are plain, toe-up socks (using this toe-up tutorial) for my husband. I’ve used the remnants of the Spring Grass socks as contrast yarn. While I am 100% in love with toe-up socks, I must say that I definitely prefer the fit of the top-down heels. We’ll see what Aaron thinks of the heel. Finally, I was wondering if you bloggers have a preference about extra short sock/mitten DPNs. I bought 5″ Inox sz 0 DPNs for the Spring Grass socks but I would like some even smaller. Do they exist in metal? No bamboo/birch DPNs below sz 4 – I snap them like twigs! 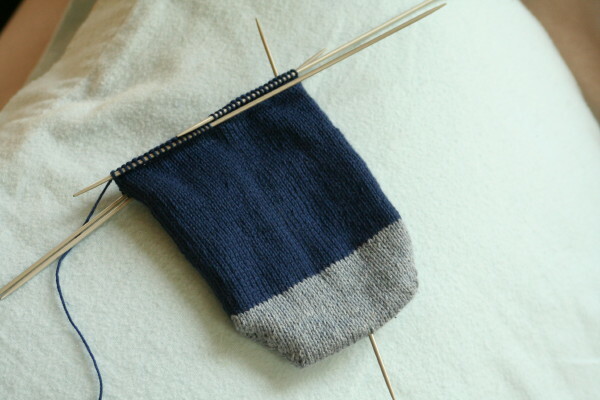 I’m working on 7″ sz 1 DPNs for Aaron’s sock but I’d love to find some really short ones. I’m not sure 5″ is short enough to warrant buying new sets of needles. Can you get 4″ needles? Anybody? I would love to hear about what you sock/mitten knitters use! Three posts in three days… can you tell I’m on vacation? Yes, a break from graduate school for me means lots of knitting, reading, lounging around by the pool and blogging. While I am taking a morning class this summer, I am mostly looking for ways to distract myself from the uncomfortable aspects of the third trimester of pregnancy, best described in Cari’s latest post. I promised finished objects to come and so here is my finished Spring Grass sock from Craftaholic’s pattern! 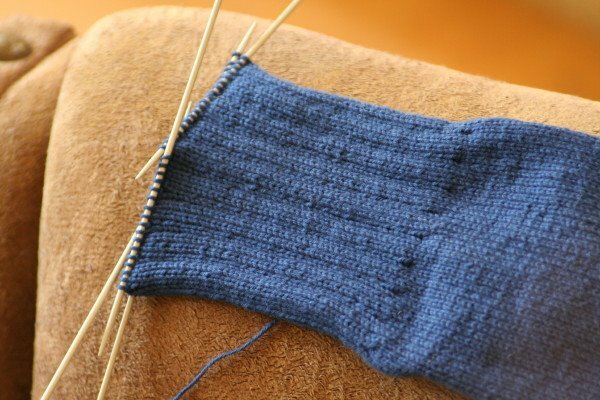 As you may recall, I frogged down to near the ankle after finishing the sock and realizing it was too difficult to put on. This time, I added a total of 8 stitches on the way up in two separate increase rows. The sock goes on much easier but I still will lament the lack of stretchiness of cotton sock yarn. I dislike how the sock does not keep its shape well after trying it on. I had to wash it to get it to return to its original shape. 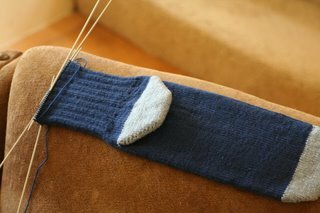 I’ve never been able to avoid this problem when knitting cotton socks – any readers care to comment??? I would love some advice. In the end, I feel like the lack of stretchiness is something my mom will have to live with as penance for having a wool allergy!! I fell off the wagon on my seven month yarn diet this evening. In fact, I’d been planning to break down to buy yarn for some necessary projects. In any case, I found that Unwind Yarn is selling Fortissima Cotton sock yarn in a few solid colors at closeout: $2.50/ball! It retails for $7-8/ball and you generally need two balls for a pair of socks. Have at it, fellow bloggers! I just bought 6 balls of my own. Ahhh… it felt so good to buy yarn!! !